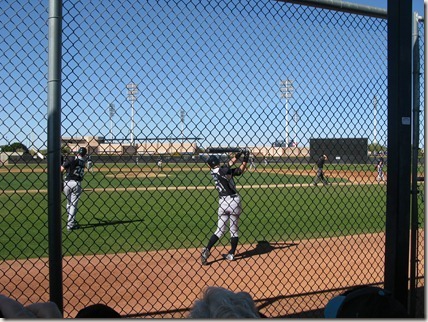 In all my travels to Phoenix, I've never attended a MLB Spring Training game. Today, we visited the Peoria Sports Complex, home to both the Seattle Mariners and the San Diego Padres, both part of the Cactus League. 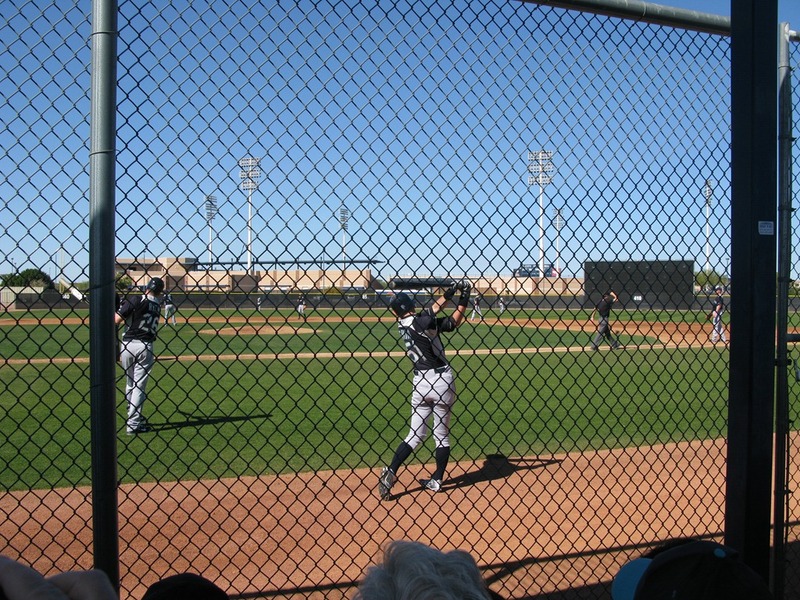 Today, the Mariners held their first intersquad game (basically, Mariners vs. Mariners). 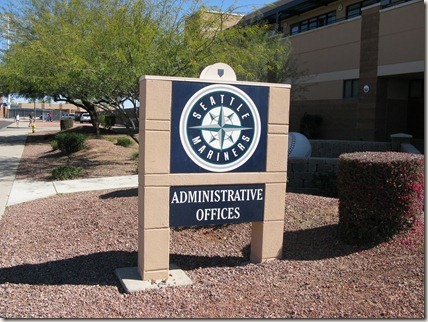 Before we went to the game, we stopped by the Mariners' administrative office to see a college friend of Brenda's, Shannon Drayer, who reports for 710 KIRO and ESPN and writes a Mariners Blog. It was nice to see Shannon after 20 or so years (I also knew her in college). Shannon told us where to go for the intersquad game, and said it was quite rare to see all the main players on the same field at this point. But there's a big difference between this facility and the MLB ballparks: Here, some of the barriers between fan and player are removed. For example, you might run into a MLB player as he walks between the clubhouse and one of the fields (we ran into Charlie Furbush). We walked under the blazing sun to Practice Field #1 and found a spot in the covered, metal bleachers. Out in the field, MLB players were practicing on an immaculate field -- but it wasn't too much different from the ones I played on as a kid (at least the way I remember them). 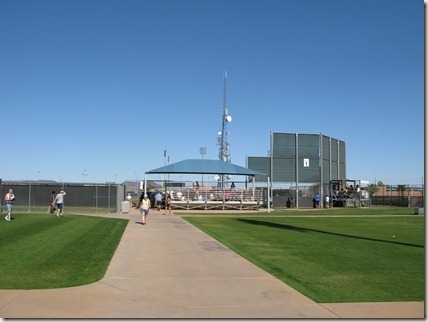 The dugouts are right next to the bleachers and are above-ground (although the dugout is hidden from the fans by a black tarp). The on-deck circle is right in front of the bleachers. I almost expected one of the players, like Shoeless Joe in Field of Dreams, to ask me from the on-deck circle, "Is this heaven?" When the game starts, the crowd is at first silent. No one is used to being in such an intimate setting with the players, coaches, and umpires. As the game proceeds, fans begin to call out to their favorite players, rooting them on. And unlike in a stadium (at least where I usually sit), they're all within earshot of both the players and the fans. Being this close to the action makes you realize the true speed of a major league pitcher -- or the bat speed of the hitters. Many of the hits I couldn't even follow into the outfield. 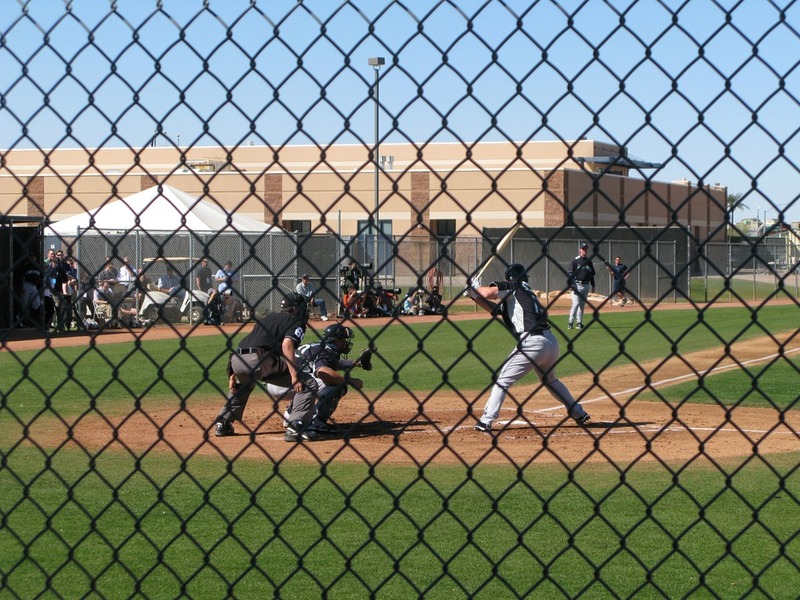 You realize that this is how the players see the game and, except for the speed of it, it's not too much different than what you see on a Little League field. But this isn't Little League. This is "The Show." To get to this level as a player, you're in an elite group. Only around 10% of all the players who make it to the Minor Leagues get called up to the Majors. In this game, I think some of the 10% were there. They don't even have a name on the back of their uniform. One unnamed player walked up to the plate. He stood there patiently in the batters' box and got walked. Once he got out to first base, he walked off the bag as if to celebrate. And the pitcher picked him off. Perhaps that was the end of his dream? Perhaps not. Then there's Ichiro. 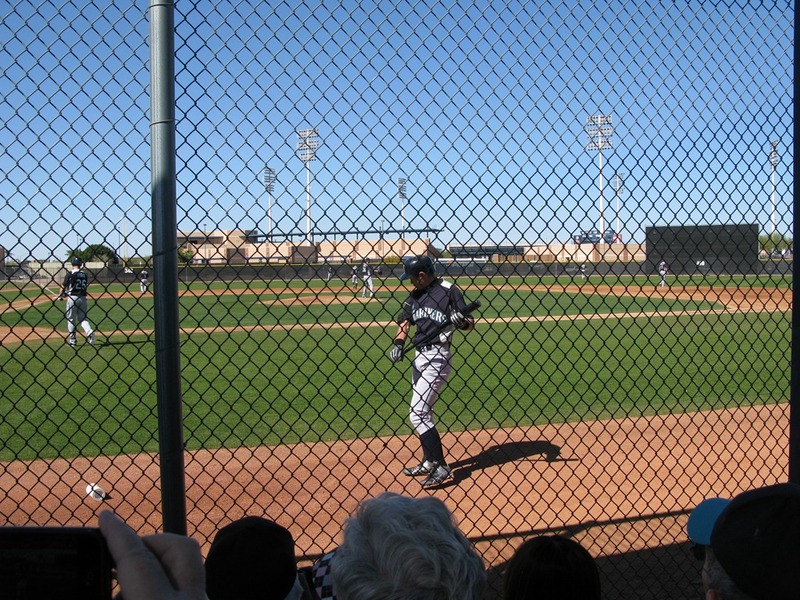 I've seen him play many times in Seattle, but when he walked out of the dugout right in front of us, it was like a movie star strolling onto the field. 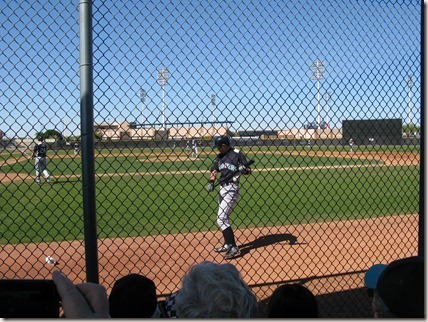 One young Japanese fan waved at him, and I half expected Ichiro to wave back. 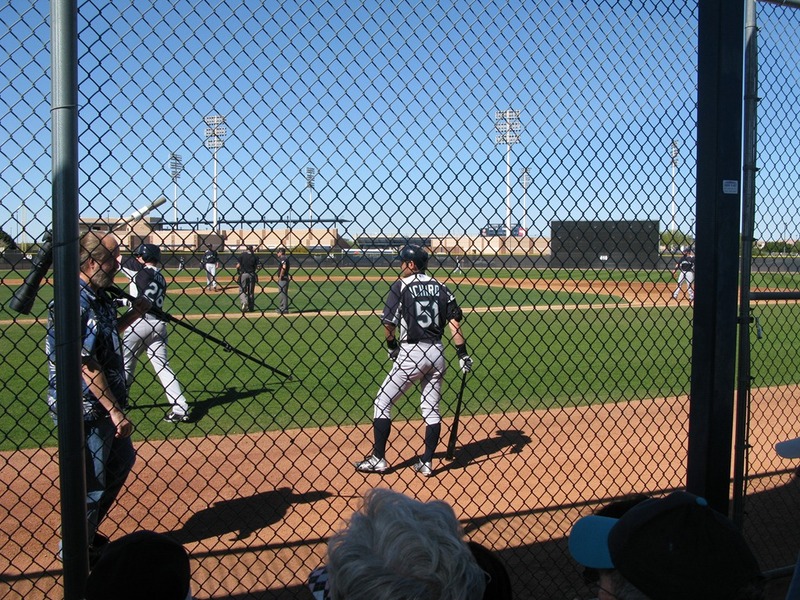 But this is Ichiro, the stoic Zen warrior preparing for battle against the pitcher. There aren't many people who can hit a fastball going 85 or 90 mph -- especially in front of thousands of people. For the ones who can, it takes a superhuman level of concentration. The routine Ichiro goes through in the batter's box is how he focuses, how he prepares. As I watched him at close range, I got the feeling that it doesn't matter if there are 100 people or 25,000 people watching him. He goes through the same routine. Later, as Cameron and I were walking back from the bathroom, it looked like the game was over. When I talked to my mother-in-law, she said that Ichiro left the game with all his bags. As soon as he left, half the fans left with him. Which made it easier to find a seat in the bleachers. After the third out in the second inning, the manager asked for another batter and Miguel Olivo stepped in the batter's box. Evidently, this was so Vargas could get his pitch count. 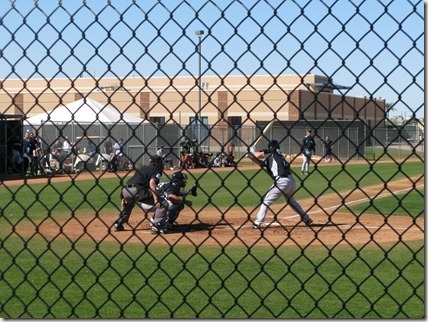 Brendan Ryan hitting a home run and running into the dugout after passing first. We thought this is just what they do in a game like this. But I read in Shannon Drayer's blog that it was about not disrespecting his own pitcher, Oliver Perez. It's interesting how we've come to depend on the announcers and TV commentators to explain what we've just seen. It makes you realize how mass media distorts a game and takes away the immediacy of a live event. But even when we attend the live event at the ballpark, it takes on a different reality. Which brings me back to Field of Dreams. In that movie, Ray Kinsella (Kevin Costner) is sitting in the bleachers at his personal ballpark, watching some of the greatest players play in front of him. For much of the film, other people who don't believe in Ray's dream can't see the players on the field. But then, the magical world opens up to them, too. Watching an intersquad game is a lot like that. The players, who have until now been phantoms on TV, have suddenly come to life under a bright blue sky. There are no announcers or big screens to distract you. There are sounds from the small crowd and the ballplayers themselves. Now you can see baseball the way it was meant to be played.